When you have kids who love animals, they will surely want to get this Playmobil Large Zoo Set With Entrance (#4850) this coming Christmas. It must on the top of their wishlists so make sure you get one of these before stores run out of stock. The PLAYMOBIL Large Zoo with Entrance is bringing the zoo to your home! Or at least to your child’s playroom. This toy is made by the largest toy manufacturer in Germany, which speaks to its quality and durability. It also means they know what kids love and have implemented it all into this playworld for your little one. The intricate details they’ve carved into every nook and cranny is really something astounding. All of this so your child can get hours and hours of playtime out of it, which is particularly important here since it comes with quite a hefty price tag attached. If your child has loved any of the other themed playworlds from PLAYMOBIL, they will love this just as much, if not more. Not only is it huge in scale, it also comes with 5 figures and numerous animals to populate your zoo. Although this is more for roleplaying for your child, you can join them for the fun yourself during assembly time. Given the scope and size of this playworld, and also the tiny pieces that have to fit together, it’s best if there is an adult to help out. You don’t have to drive to the zoo to see the animals and watch the caretakers feed them. This playset includes several animals that your kids surely love. They will be fascinated with the details of the miniatures that they wouldn’t want the day to end. Playing with this set and controlling the feeding times is indeed a great opportunity for every kid. Before you start your day at the zoo, take a look at the map so that you know which route you’d want to take first. Push the baby on her stroller and watch over that naughty little boy. Make sure he won’t be doing any devastating tricks at the zoo. Step into the zoo and watch the caretakers run the whole place and feed the animals. Take a look at the adjustable clock to know the feeding times of the animals. You surely wouldn’t want to miss that when you are in the zoo. Visit each of the animal enclosures where adult and baby animals live. Before going back, get a souvenir at the shop to make your visit to the zoo a very memorable one. You can choose among the souvenir pieces there to give to the boy and the baby. You can decide when the zoo closes because after all, you control everything. This large zoo playset consists of lots of animals from different places around the world. There are a lion, lioness, and two cubs; an elephant and a baby elephant; a zebra and a baby zebra; as well as a giraffe and her baby. The two caretakers have their grooming equipment as well as food for the animals. There are also placards, enclosure pieces and pillars, water stands, a tree and other pieces. It would be entertaining to control the animals especially because they are jointed, and you can move some parts of their body. This is the playset that every animal lover must have! The customer reviews of this product are mostly positive. As mentioned before, the hefty price tag can be dissuasive, but many people have said it makes for a great Christmas present. Many reviewers mention specifically that they’d bought it for their kids who love roleplaying, whether it be with dollhouses or just their animal figurines. Many also think it’s a good investment because their kids have spent countless hours playing with it, which justifies the price. It can also be put away in storage for future kids to play with one day, given its durability. Parents especially love the educational aspect of this playworld. For younger kids, it is a very good educational tool, as well as a fun toy world that stimulates their imagination. Both children and parents have been delighted by the numerous little quirks of the playworld, including the little food for the animals to eat, and small “stuffed toys” for the souvenir shop. The foods can also be used as a learning tool, to teach the children which animal eats what. Some of the busier parents disliked the long assembly time, and the tiny little bits and pieces included in the set that can get lost, but other parents loved spending that time bonding with their kids and teaching them what goes where. The former was especially the case for those with younger kids because for them it is very difficult to figure out the assembly without an adult. The playworld is also not suitable for kids under 4 because of the many little parts that can pose a hazard. A general complaint most had was that there are several bits and pieces shown in the advertisements for this that have to be bought separately. A big pro of this playworld is how it can be used to teach smaller children about animals at the zoo. The visual aid is very helpful in getting them to retain the information, and after they’ve spent hours playing with their little animals, they’re not likely to forget what they are, what they eat and where they go. Each of the animals can sit, stand, move their legs and turn their heads, so that your child can go wild with their imagination and roleplay to their heart’s content. This playworld is particularly great for those with 2 kids close in age, as they can play with it together. The playworld can also thankfully take a lot of wear and tear, which it is expected to go through given how many hours your kids will be pouring into it daily. Cons include how some parts have to be bought separately for the full effect, although it is still great on its own. The small parts can also be lost easily if you are not careful when putting this away. 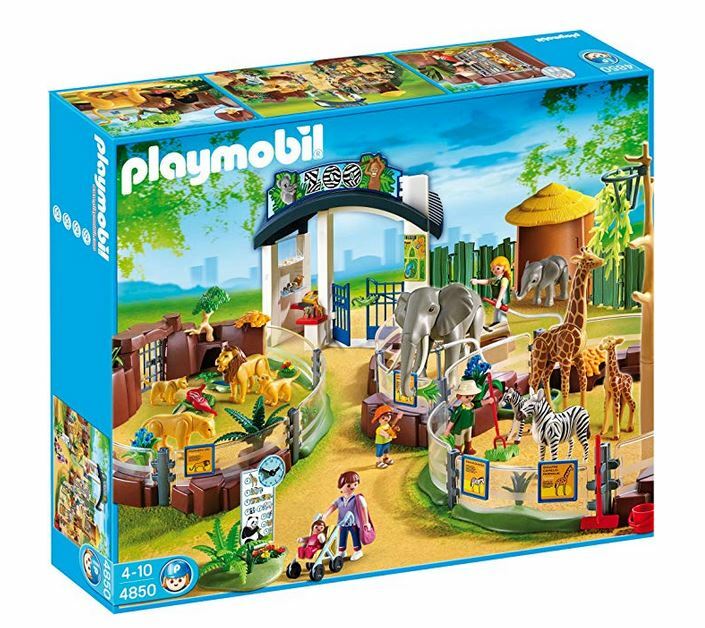 The PLAYMOBIL Large Zoo and Entrance is a great Christmas present for kids who love playing pretend. The different moving parts and small details really help facilitate a growing child’s imagination and wonder with animals. Although the assembly takes some time, most parents will agree it is well worth it once it’s done. Your children will be off for hours in their zoo world, bringing their animals in, taking them out, feeding them, and making the human family interact with them. According to many parents, this is a great investment for the family, as it doubles as an educational tool.